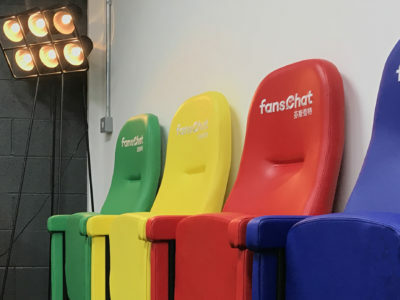 In addition to our standard range of seating for auditoria, offices and public areas, we can also manufacture bespoke seating to meet customers’ specifications. With our bespoke design and manufacturing service we can offer a range of products, materials and solutions to fit your exact requirements, taking into account style, space, functionality and finish. 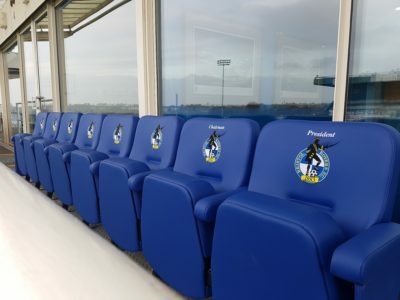 We regularly work with architects, contractors and venues to develop new seating solutions and can also modify any of our existing range to meet clients’ specific needs. 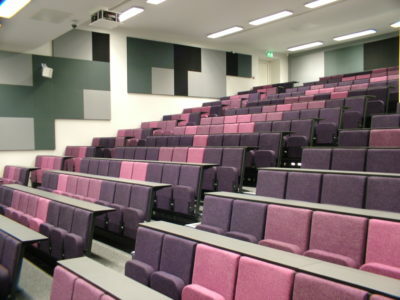 Our bespoke seating can be designed to fit exactly into your auditorium with a wide range of fabric, vinyl and leather cover materials available. Here are just some examples of the different things we have done but if there is something else you are looking for then please get in touch to discuss your requirements. 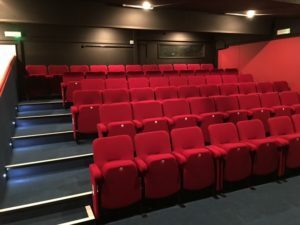 These extra wide seats which can accommodate two people have been regaining popularity in recent times and we have made bespoke solutions for several theatres. 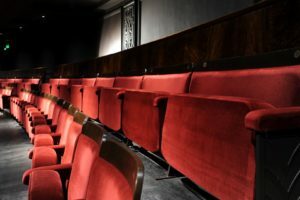 Love seats are an attractive feature and are always popular with the audience. 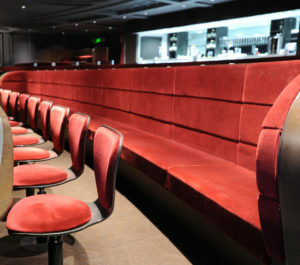 The Love Seats pictured here were bespoke designed for the Royal Court Theatre in Liverpool where they were installed all along the back row of the Circle. 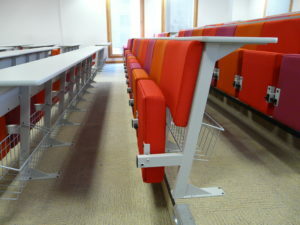 The standard desks which can be fitted to our Diploma and Aspire lecture theatre seating run in a continuous fixed row along seat backs. If this doesn’t meet your requirements then we can look at various other options such as these individual fold-away desks we produced specially for Oxford University. 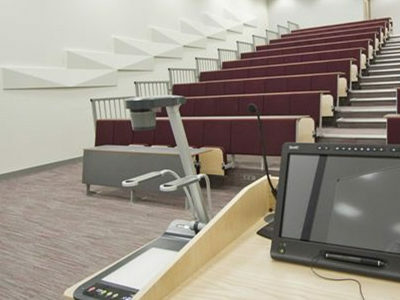 Removable desks are frequently used in the front row of lecture theatres to provide space for wheelchair users. 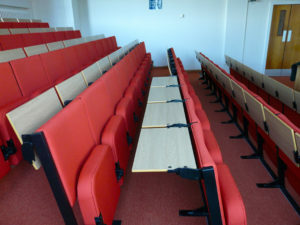 Whilst the majority of desks in this lecture theatre are fixed to the floor, the two larger desks on the front row are on wheels, allowing them to quickly and easily be removed and re-positioned as required. 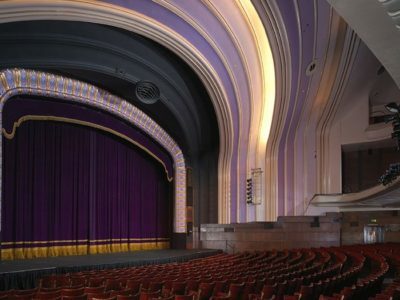 Most auditorium seats in a theatre are also fixed to the floor but the front row of seats in this theatre includes a removable bank of 3 seats at beginning of the row (which can be seen where there is a double arm rest). 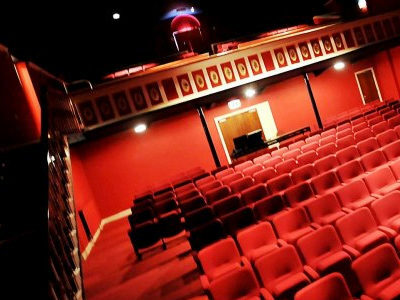 Removable front row seats give more flexibility in venues like this where seats can be taken out to accommodate the required number of wheelchair users at each performance. 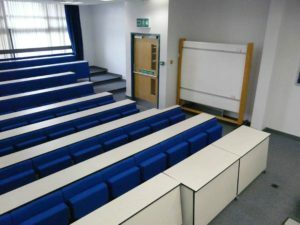 This university asked us to supply our lecture theatre seating with integral storage baskets under the desks, allowing students to store their belongings off the floor. 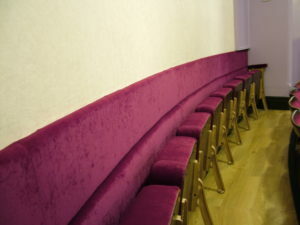 As part of this theatre refurbishment project we upholstered and fitted a new panel along the length of the wall on the back row. 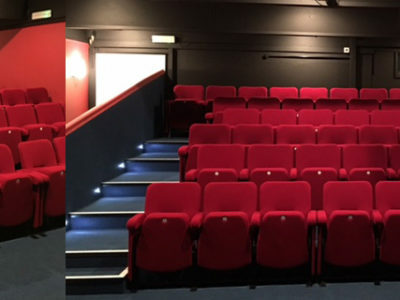 We refurbish a wide range of auditorium seating every year and our bespoke design capabilities allow us to tailor seats of all styles and designs. 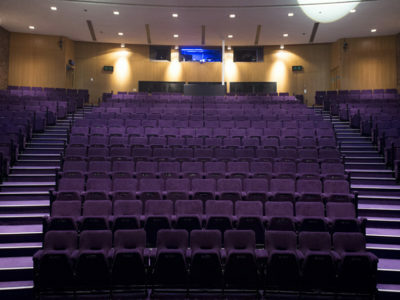 Swivel chairs are not just for the office and can provide a stylish seating solution in theatres and other venues. 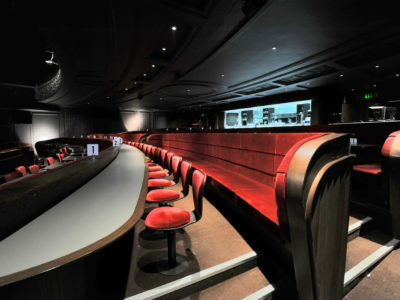 Evertaut refurbished this plush yet functional seating for the bar area of the stalls at the Royal Court Theatre in Liverpool. We also refurbished and reupholstered the banquet seating seen behind the swivel chairs.